The First Organizational Meeting of the future I.S.A. was held at Columbia University, New York City, on Dec. 2, 1944. The CANADIAN SOCIETY for MEASUREMENT and CONTROL was represented by T.C. (Chuck) Agnew of Honeywell Ltd., Toronto, Ontario. Chuck, now retired as Manager of Systems Engineering at HONEYWELL, tells us that the founding meeting of ONTARIO SECTION, I.S.A. in 1948 was a dinner meeting sponsored by HONEYWELL and held at DIANA SWEETS, a well-known restaurant in downtown Toronto. 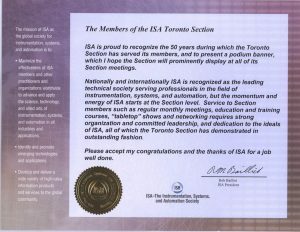 ONTARIO SECTION was recognized by I.S.A. headquarters in their January 1946 listing of known organized instrument groups. W.S. (Stuart) Mills (FOXBORO) represented the 60 members of ONTARIO SECTION at early meetings of the I.S.A. Executive Committee and Board of Directors and at the INSTRUMENTATION FOR TOMORROW Conference and Exhibit in Pittsburgh, September 16-20, 1946. I.S.A. Toronto hired Mary Sibley for the permanent position of ISA Toronto Section Secretary. Mary successfully managed section administrative and memberships tasks fro many years. In the 1950’s meetings of TORONTO SECTION were moves to the (Ontario) PROVINCIAL INSTITUTE OF TRADES, (now George Brown College of Applied Arts and Technology), home of the only instrumentation training course in the province prior to the opening of Ryerson Institute of Technology’s (now Ryerson Polytechnic University) Instrument Technology Course on 1953. Chuck Agnew and John Huether represented ISA Toronto Section on the Advisory Committee for the new course. 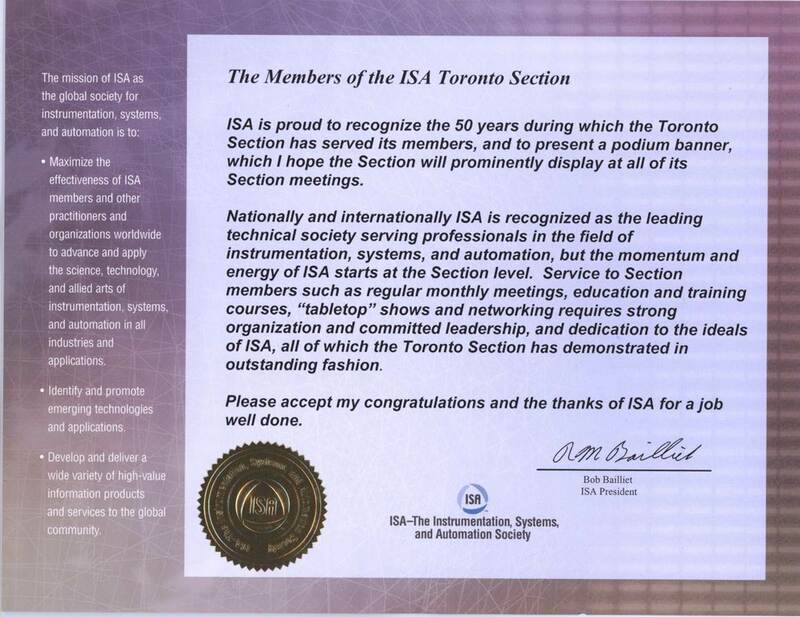 Faculty and students were welcomed to ISA Toronto Section; many remained members of the section for many years. The November 26, 1957 meeting featured a presentation on the computers by Messrs. Ted Baltic and Bobo Allen of Remington Rand. It is noted that “a complete payroll for 10,000 people can be processed with printed cheques in less that 2 ½ hrs”. Emphasis on technical advancement marked the decade of the 60’s. Presentations at the monthly Members’ Meetings included fluidics systems as well as an increasing emphasis on the application of computers including direct digital control. Frequently the meetings were held at the instruments manufacturers’ premises where larger systems could readily by demonstrated. At the same time, an energetic editorial staff kept readers of our newsletter, “The Transmitter”, with discussions of frequency response of control systems, gas chromatography, and vibration measurement. Toronto’s computerized traffic control system – one of 6 know digital traffic control systems. The 1970 records showed marked improvement in financial position. The section’s ending bank balance was reported at $159, a considerable improvement from a deficit of about $400 for the previous year. At this time, it was decided that the time was ripe for further expansion and assistance was provide to a group in the Northern Area of Ontario & Quebec to form a local associate group, which by 1972 had nurtured into the Northern Ontario Section. The 1972 roster showed memberships had increased to 215. With the increasing acceptance of digital control systems, Toronto section experienced rapid growth as new members of the electrical persuasion joined their primarily skills to our Society. During the mid-80’s Toronto Section Inc. Sponsored a very active Computer Group to assist members moving to the new technology. Stanley Weiss, M.Sc from Yugoslavia & M.Sc from Austria, founder of Weiss Group of Companies, became the first Canadian to be honored / elected to the positions of President-Elect Secretary of ISA in 1986. In 1988 we rented office space at 605 Royal York Rd – ISA Toronto headquarter for many years. This was followed by election as ISA President in 1987 and Past President in 1988. Fortunately, the opening of our office coincided with the retirement from Foxboro of Mary Sibley. Known throughout the Industry for her quiet, efficient manner, Mary became our Executive Assistance with the responsibilities for office administration. Mary continues to respond to the needs of our members; her excellent telephone manner is undoubtedly responsible for many new members and for much-appreciated advertising revenue for our newsletter “The Transmitter”. Memberships continued to grow into the 1990’s. In 1992 the roster showed well over 800 members. The 90’s may well be remembered for participation in ISA Conferences and Exhibits. In addition to active participation in the large USA Shows and our own biennial Toronto ISA Show, Toronto Section with the help from Hamilton, Montreal, and Sarnia Sections hosted ISA/92 – Canada. With attendance in excess of 10,000, this was the most ambitious project tackled to date. It’s success quarantined a repeat performance and we look forward to seeing one and all at ISA/95-Canada at the Metropolitan Toronto Convention Centre, Toronto, April 25-27 as we enter the second half of ISA’s first century.